I just returned from Lancaster County yesterday. This was my 3rd visit in the past half-year. The corn began coming down early this year, on account of the especially dry conditions. Otherwise, it was beautiful autumn weather and I enjoyed a couple of sunny days, until torrential downpours hit as I was leaving the County. Apparently there was a lot of flooding, which shut down the courthouse and public schools. I was up in Lancaster to participate on a couple of Amish-related projects. More details to come, but for now I’ll just say it was a lot of fun (and I should add, had nothing whatsoever to do with Amish energy drinks). While in Lancaster I stayed in a couple of friends’ homes, including Abe and Sara’s. They are up to 3 boys, and their youngest is crawling around now, all smiles. It’s really amazing to see the changes kids go through, even over just a few months (my last visit to PA was in April). Since I was staying in Amish homes, I was off the internet for a few days, but it was nice to see all the comments on the Munfordville, Kentucky Amish post when I returned. On my drive home to NC I had a chance to visit the Mechanicsville, Maryland Amish. This is a Lancaster daughter settlement and the largest of the few located in Maryland. Stay tuned for a post on this community. While in Lancaster County I also stopped by Elizabethtown to meet with Donald Kraybill, which I always enjoy. Don shared a bit about a new book, The Amish Way: Patient Faith in a Perilous World, which he co-authored with Steven Nolt and David Weaver-Zercher. We’ll be having an interview and more on the book next week (including a 10-book giveaway contest) but for now I just wanted to share a brief clip of Don discussing the book and Amish spirituality. Interesting! I am quite familiar with the Amish settlements in Southern Maryland. Growing up in the area in the 60s, they always fascinated me. I remember my uncle hiring an Amish crew to build a tobacco barn on his farm. He always raved at their skill, speed and courtesy. I remember my aunt preparing a fried chicken lunch for them. Very interesting post. 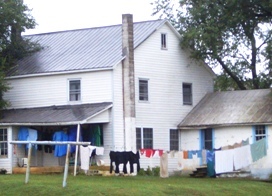 Love the picture of the house and clothes drying on the clothesline. I didn’t realize there was an Amish community in Mechanicsville. Have they been there long? I grew up in Western Maryland where there are Amish and Mennonite in the area and just over the state line in PA. I have 1940 as the start date for the Amish settlement, so it has been there awhile. Am not sure on the Mennonites. I will have a full post on the Mechanicsville MD settlement up soon.